Yuehe Lin at Pacific Northwest National Laboratory is now a Royal Society of Chemistry Fellow. 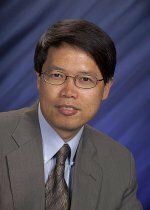 Congratulations to Dr. Yuehe Lin at Pacific Northwest National Laboratory on being appointed a Fellow of the Royal Society of Chemistry, UK. The honor is given to researchers who have made outstanding contributions to the advancement of chemical science. Lin's research focuses on nanotechnology, particularly developing nanobioelectronic devices and nanomaterials for both diagnosis and drug delivery. For example, Lin is developing chemical and biological sensors based on functional nanomaterials, like protein cages, quantum dots and graphene, that interact with enzymes, antibodies and DNA. The technologies he's developing can detect biomarkers, explosives, and pesticides. He is a prolific author and editor. He has published about 300 papers, with over 11,000 citations and an H-index of 60. He is the editor of Handbook of Electrochemical Nanotechnology and a section editor of Encyclopedia of Microfluidics and Nanofluidics. He serves as the associate editor for the Journal of Nanoscience and Nanotechnology and is a member of the editorial advisory board of 20 international journals. He has over 10 patents, with half licensed to industrial partners for commercialization. The Royal Society of Chemistry has more than 47,500 members worldwide. The largest chemical society in Europe, the organization works to promote the development, practice and application of the chemical sciences across the world. In particular, the society encourages the participation of students and young people in chemistry.